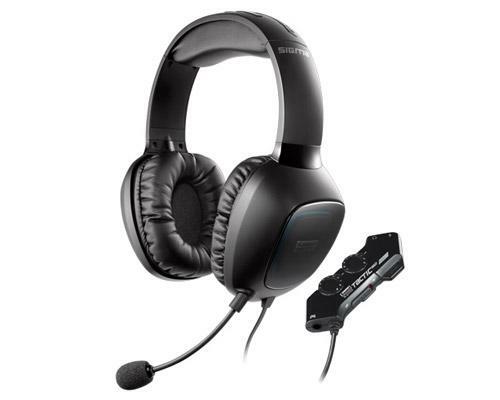 Experience high-resolution 3D gaming audio with the Sound Blaster Tactic3D Sigma gaming headset. Hear the clash of weaponry and the sound of footsteps as if they are really happening with high-resolution 50mm Neodymium drivers that produce the finer details of game audio. Touchscreen software and TacticProfile™ allow you to save and share your favorite settings including THX® TruStudio Pro Surround™ for immersive 360° headphone surround and VoiceFX™ voice morphing technology. In addition, enjoy a choice of analog or USB connection with Dual Mode™. Use the headset in analog mode with standard minijacks or connect the Dual Mode™ USB adapter to your PC or Mac for the full THX TruStudio Pro™ experience. Dual Mode - Analog or USB, your choice! THX TruStudio Pro Surround audio immerses you in the game so you hear sounds clearly from the front, back, around, above and below. Only THX TruStudio Pro Surround delivers truly 3D audio surround effects to give you the gaming advantage you need. Nothing speaks more clearly of great sound than the high-resolution 50mm Neodymium drivers that unveil fine details with sonic accuracy to deliver the best gaming experience ever. Customizable TacticControl™ driver interface optimized with Live!Touch™ for touchscreen controls under Windows 7 operating system gives you full control over every nuance of the THX TruStudio Pro audio suite as well as custom graphic equalizer and VoiceFX controls. Customize your own TacticProfile™ EQ and audio profiles, and then export and share them with other gamers. You can also use pre-configured audio settings from world-renowned gamers such as Fatal1ty, compLexity and Team Dignitas. Morph your voice into different in-game characters with VoiceFX technology and restore surround audio to your Windows XP games in Windows 7 with Creative ALchemy. A steel core headband ensures a precise fit, and offers maximum durability for marathon gameplay. Use the Sound Blaster Tactic3D Sigma headset with your favorite gaming communications software such as Ventrilo or TeamSpeak.